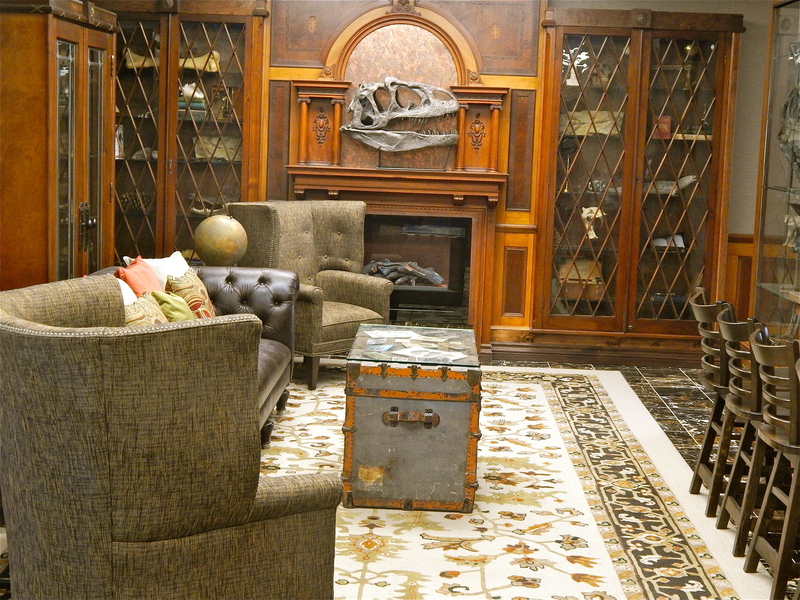 Ethan Gilsdorf reports on the most awesome hotel in the country. Meet Stanley the Stegosaurus and friends! In an effort to stand out from their competition, hoteliers will try all sorts of gimmicks. They’ll build hotels from former jails, refurbished castles or retired railroad cars. They’ll float boat hotels, make teepee hotels, and dig underground and underwater hotels. From a Beatles fan fantasy hotel to, yes, a B&B shaped like a giant beagle, hotel owners cater to practically every imaginable oddball interest. 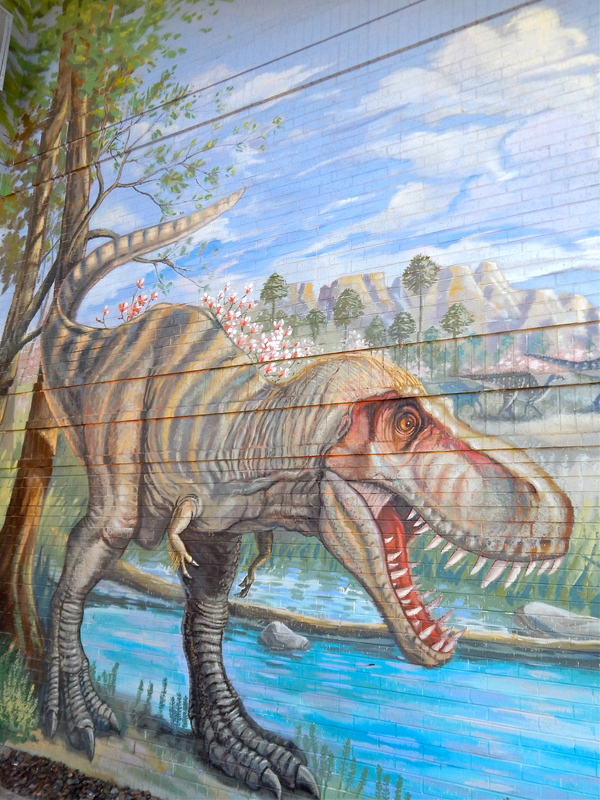 Now, add paleontology to this list of niche themes. 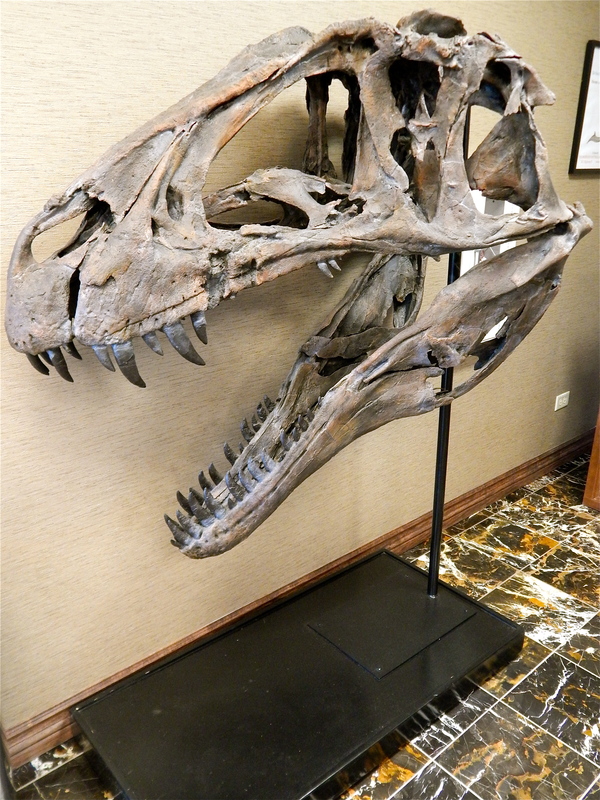 The formerly mundane Best Western Denver Southwest has been transformed into a Jurassic period playground. 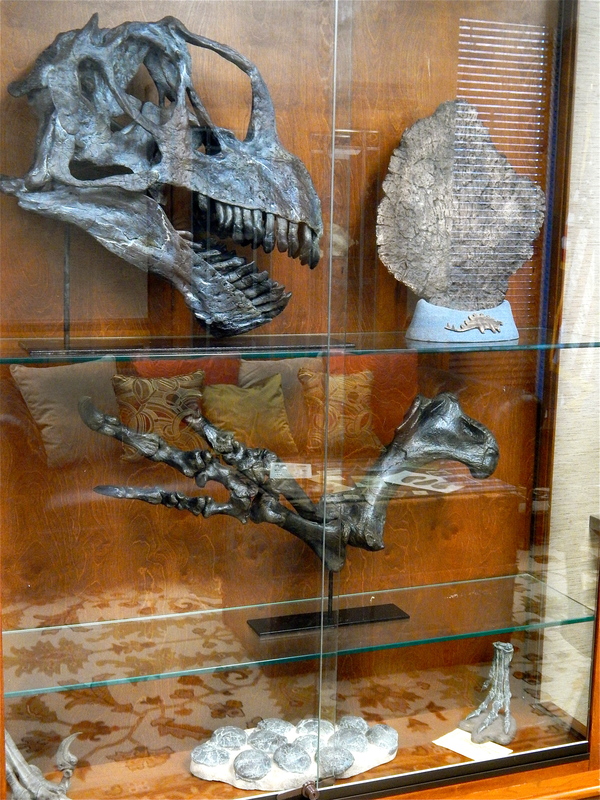 The new “digs” feature dinosaur relics and quirky paleontological touches, from sandboxes where kids can go digging for fossils to a Pteranodon weathervane. 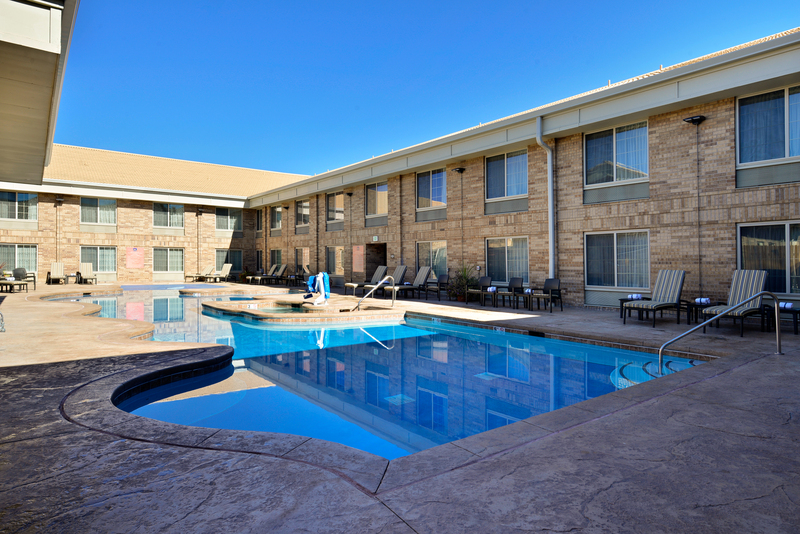 Located just outside of downtown Denver, the Best Western Denver Southwest is owned by husband and wife team Greg and Meredith Tally who, emerging from the Great Recession, knew their hotel needed a facelift to keep attracting visitors. Then came inspiration. One day, Greg was out hiking in the Dakota Hogback region of the Rockies, near Dinosaur Ridge, one of the world’s most fertile fossil sites. 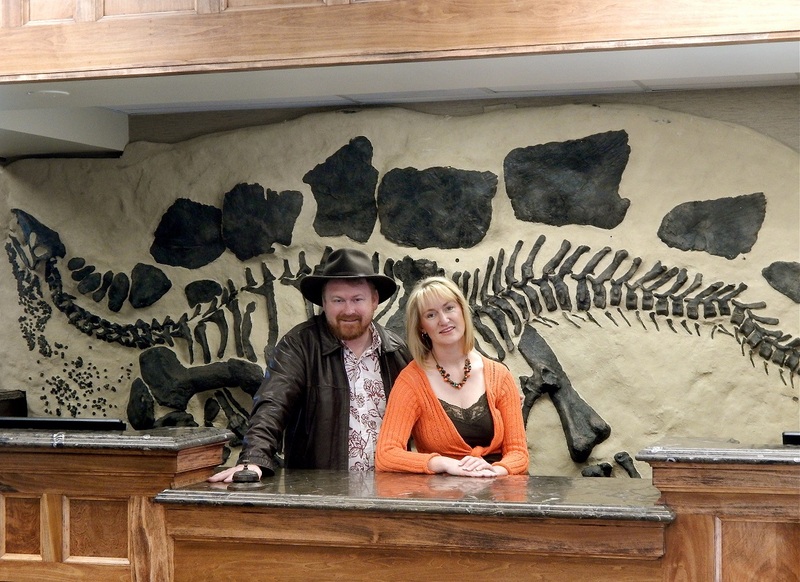 “That set a light bulb off and made me realize, ‘Why not remodel celebrating some of that unique paleo history we have right in our immediate area?’” he remembered. While a staff handles the hotel’s day-to-day operations, the couple oversees big picture vision and strategic planning, in between home schooling their two kids, Caroline, 14, and Joe, 12. 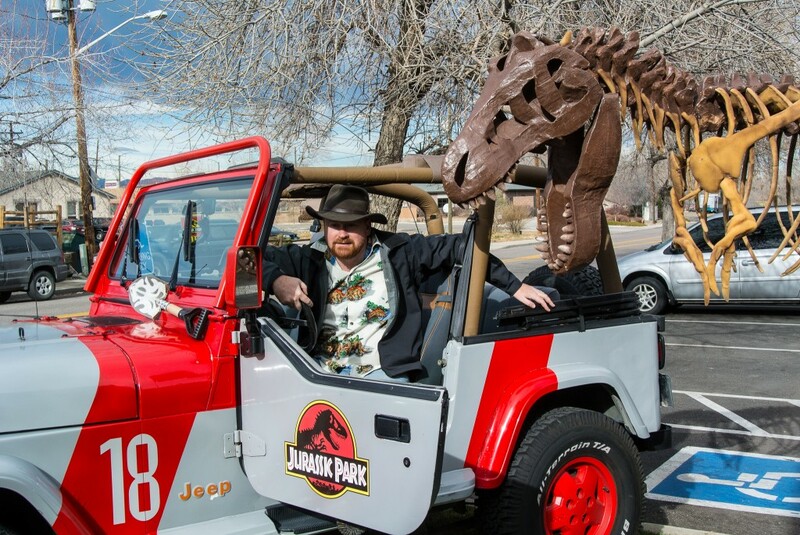 Greg describes himself as a self-trained “armchair enthusiast” of paleontology, “more P.T. 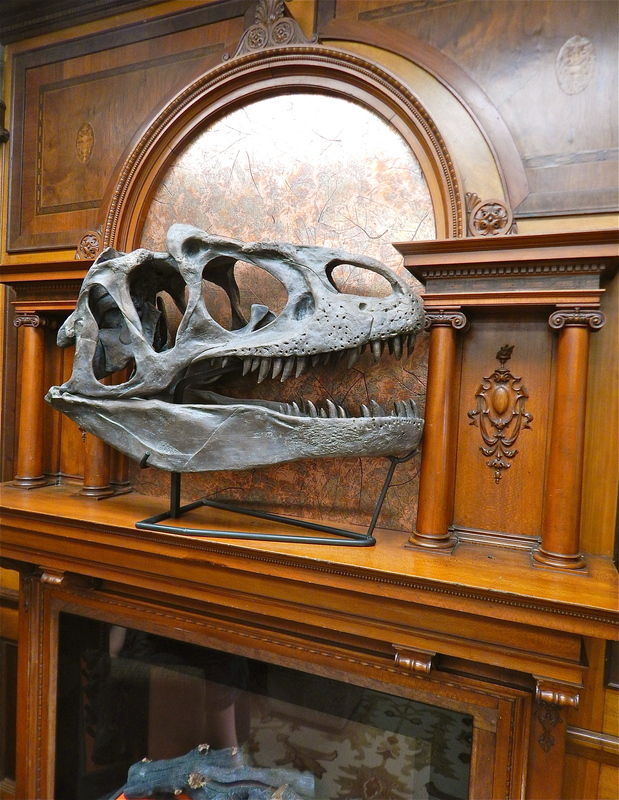 Barnum than E. D. Cope or O. C. Marsh,” the two infamous dinosaur hunters whose rivalrous and backstabbing “Bone Wars” lasted from 1877 to 1892. 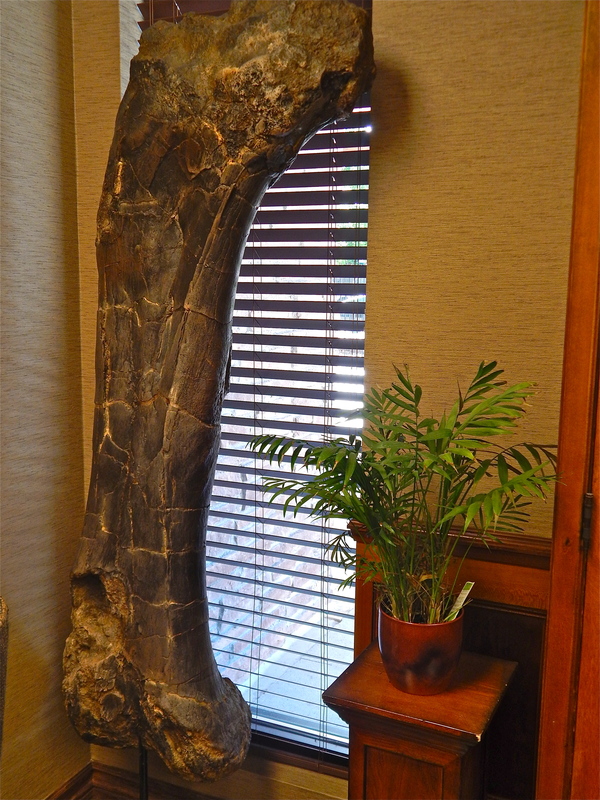 Naturally, the hotel is situated near Dinosaur Ridge, “where the first Stegosaurus came out of the ground,” Tally said. Same with the first Apatosaurus (commonly known as Brontosaurus). 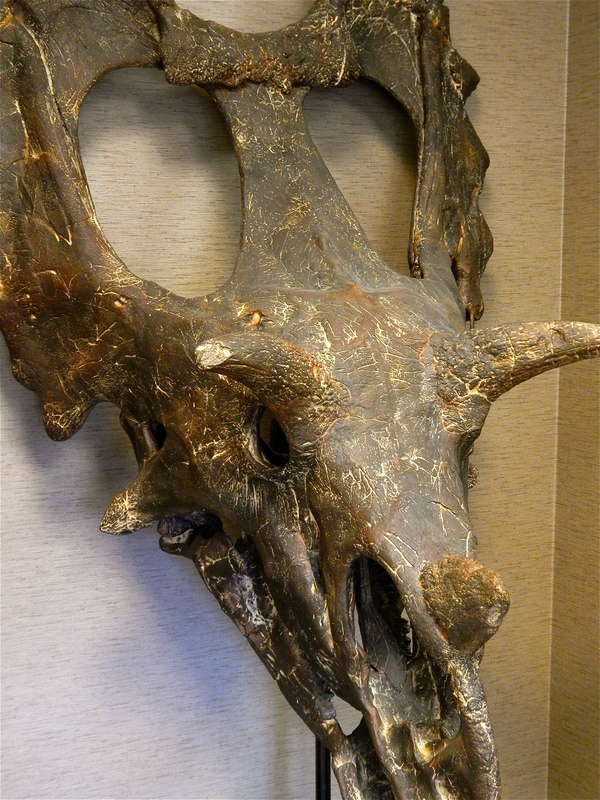 These “rock stars of the dinosaur world,” Tally said, are “just ten minutes from our front door,” as is Dinosaur Ridge’s Triceratops Trail. 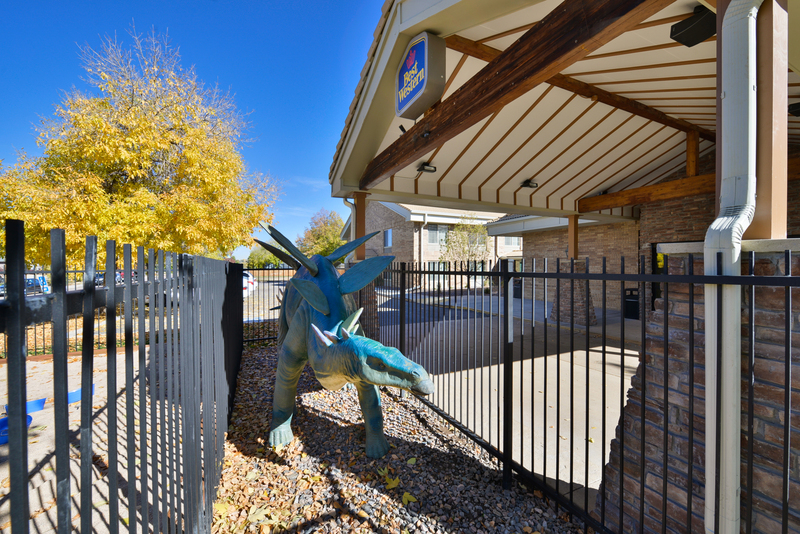 Also nearby are the Morrison Natural History Museum (10 minutes) and the Denver Museum of Nature and Science (40 minutes), making the Tallys’s hotel a perfect base for a dinosaur-themed vacation. Interest in the extinct lizards is only going to grow in 2015, when both Jurassic World (to be released in June), the fourth in the Jurassic Park film series, and the Pixar kiddie cartoon The Good Dinosaur (November) will be hitting theaters. 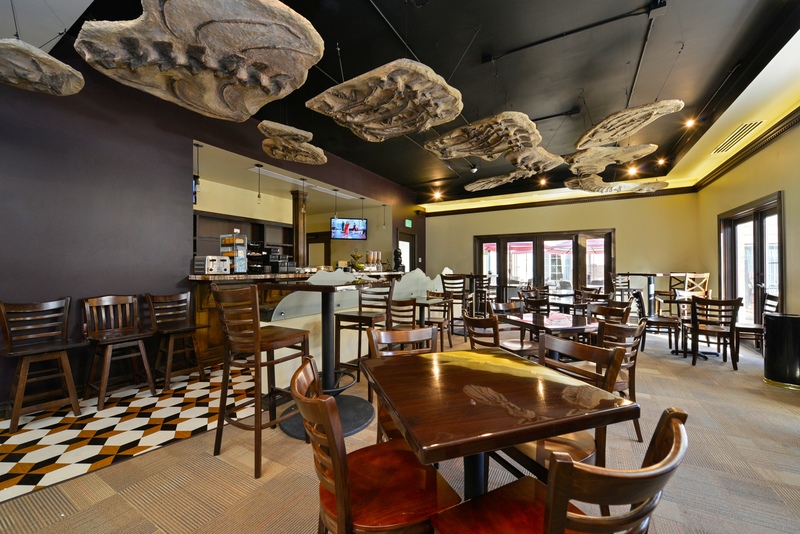 To better showcase the Tallys’s big gamble, I asked Greg to give us an exclusive virtual tour. So get out your shovel and mattock, put on your Indiana Jones fedora, and keep your eye out for stray T-Rexes as we enter the Dino Hotel. 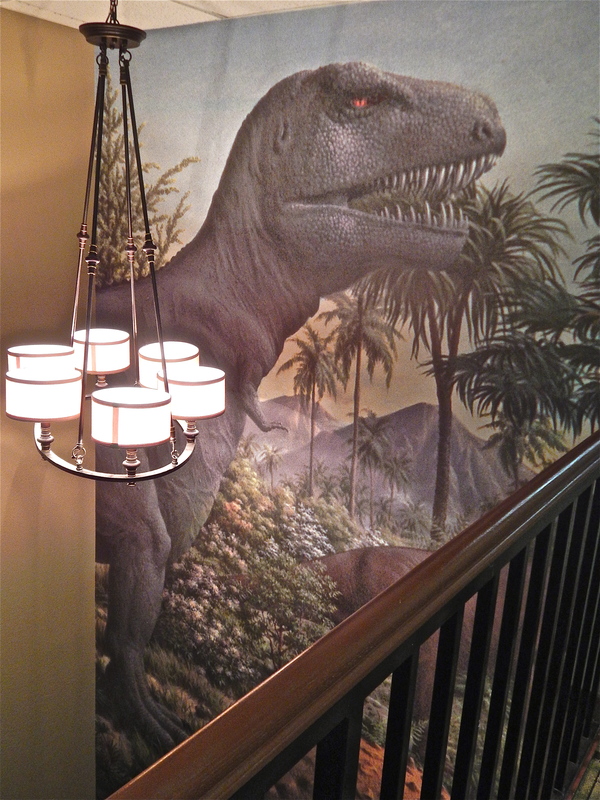 “We had some very drab back walls ... and we decided to install some murals. 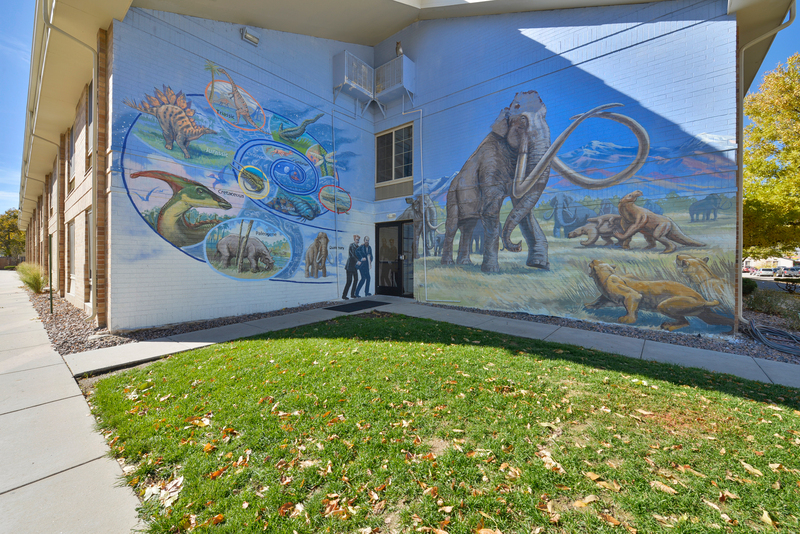 We put in a ‘Story of Life’ panel spiral of the different epochs, and we put in a mural of Ice Age Colorado, with a Columbian mammoth and a saber tooth cat and some ground sloths. 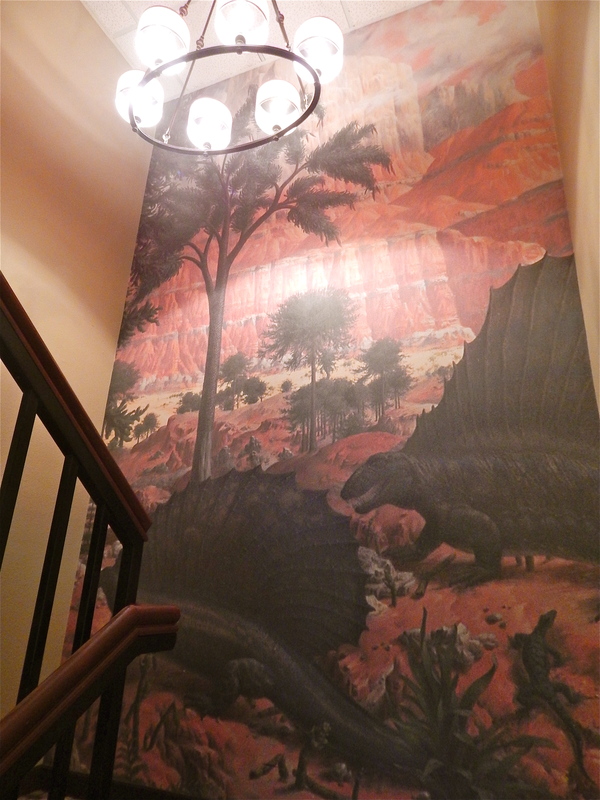 And on the other walls we put some Cretaceous scenes of a T–Rex with a great expression where people can walk up and take their pictures, and he’s alternately smiling, or saying, “Hi, you’re my lunch.” And then there’s the Triceratops on the wall right next to them.” Art is by Tom Ward, a Denver-based muralist.